Turtles — although slightly misleading in name — have always been one of my favorite chocolates, but I haven’t had one in years. 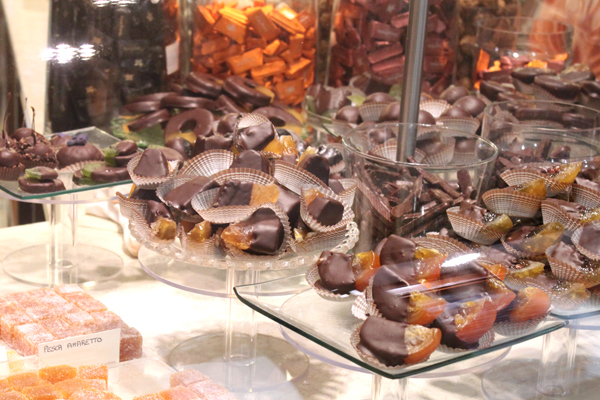 I’m a huge fan of caramel, chocolate, and pecans, and turtles have all of these wrapped in one delicious bite. So when I found this recipe for turtle thumbprint cookies on Handle the Heat (an AWESOME food blog — seriously, go check it out), I knew I had to try it. Although there are a lot of steps in the recipe, it’s actually pretty easy: the cookies have a bunch of components, but all are super simple to make: the dough comes together fast, and the caramel filling uses pre-made caramels, so it’s just a matter of combing with cream and melting. The only change I would recommend is the method for piping the chocolate drizzle on top: you don’t need to use a pastry bag of any kind — just dip a fork in the melted chocolate and shake it over the cookies (on a parchment paper, of course). It sounds like a weird method on paper, but, trust me, it works. The result is delicious, and these disappeared right away. Despite having a lot of sweet components, the recipe is well-balanced and not overwhelming. The cookie is actually pretty neutral (in terms of sweetness), so it’s a good base for the gooey caramel and chocolate drizzle, as well as the crunchy pecans. If you’re a fan of turtles — or just plain awesome cookies — give these a try! If I can make them (and I’m terrible at baking cookies), these are pretty much foolproof. In a large bowl, use an electric mixer to beat the butter and sugar on medium-high speed until well combined and fluffy. Add in the egg yolk, milk, and vanilla extract. Reserve the egg white in a separate container, cover, and refrigerate until ready to bake. In a medium bowl whisk together the flour, cocoa powder, and salt. Gradually add the flour mixture to the butter mixture and beat just until combined. Cover the dough and refrigerate for 1 hour or overnight, or until the dough is chilled and firm. Lightly beat the reserved egg white. Shape the dough into 1-inch balls. Dip each ball in the egg white, then roll in the pecans, pressing lightly to coat well. Place on the prepared baking sheet. Lightly press down the center of each ball with your thumb. Bake for 12 to 13 minutes, or until set. Set the baking sheet on a cooling rack and let cool until just warm. While the cookies are baking, combine the caramel squares and cream in a small saucepan set over low heat. Cook, stirring often, until the caramels are melted and the mixture is smooth. When the cookies are warm, press down the center of each cookie again with your thumb or the opposite end of a wooden spatula. Spoon about a 1/2 teaspoon of caramel into each thumbprint. Sprinkle the caramel with Fleur de sel to taste. Let cool completely. In a small heat-safe bowl, heat the chocolate chips and oil in the microwave for 1 minute. Stir until smooth. Using a fork, dip the tips of the fork into the chocolate and shake the chocolate out over the cookies. Make sure to use a layer of parchment paper to catch the excess chocolate. 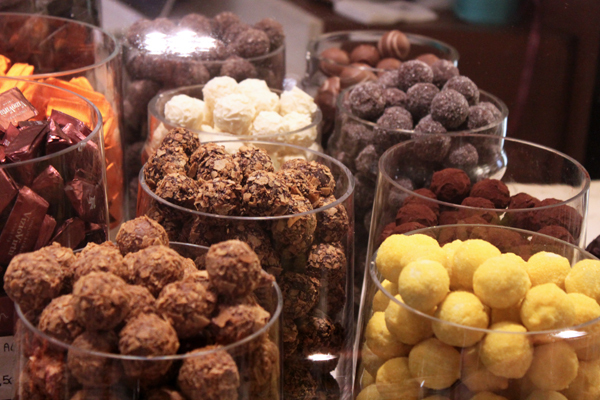 Let the chocolate set before serving or storing in an airtight container for up to 3 days. For those of you who have never experienced Momofuku (literal meaning: “Lucky Peach”) in New York City, don’t miss out on it next time your in town. It’s one of my friend’s favorite restaurants (the restaurants are noodle bars but also serve lots of other goodies), so I inevitably stop there every time we spend time in Manhattan. And the only thing that’s better, really, than the noodle bar is their dessert shop — or, the Momofuku Milk Bar (fun fact: there’s also one in Toronto, along with six locations in New York). Everything they serve is literally addictive. 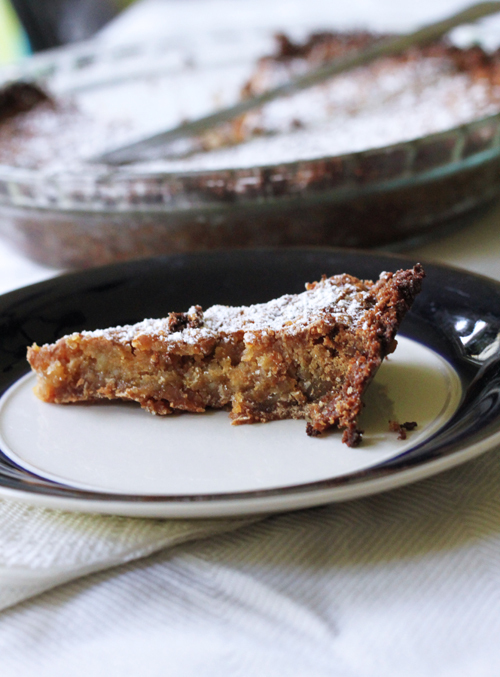 (Hence, the name “Crack Pie” for one of their bestselling pies). They sell cookies, cakes, pies, and fro-yo, all in unconventional but AWESOME flavor combinations — this is not your typical bakery! Christina Tosi, the brilliant chef/mastermind behind Milk Bar is definitely doing something right. Position rack in center of oven and preheat to 350°F. Whisk both sugars, milk powder, and salt in medium bowl to blend. Add melted butter and whisk until blended. Add cream, then egg yolks and vanilla and whisk until well blended. Pour filling into crust. Bake pie 30 minutes (filling may begin to bubble). Reduce oven temperature to 325°F. 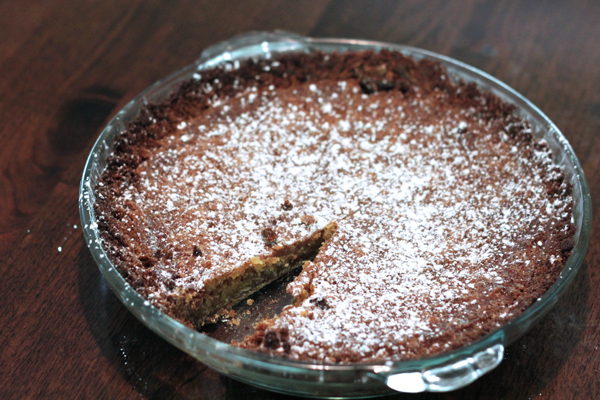 Continue to bake pie until filling is brown in spots and set around edges but center still moves slightly when pie dish is gently shaken, about 20 minutes longer. Cool pie 2 hours in pie dish on rack. Chill uncovered overnight. Can be made 2 days ahead. Cover; keep chilled. 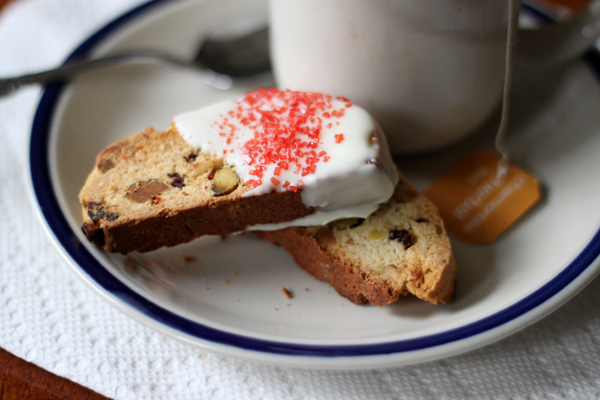 Honestly, these biscotti are delicious any time of year, and the white chocolate gives them that extra kick of sweetness. I’m not even a huge fan of biscotti (seeing as I have a major sweet tooth), but these are killer. And so easy to make! 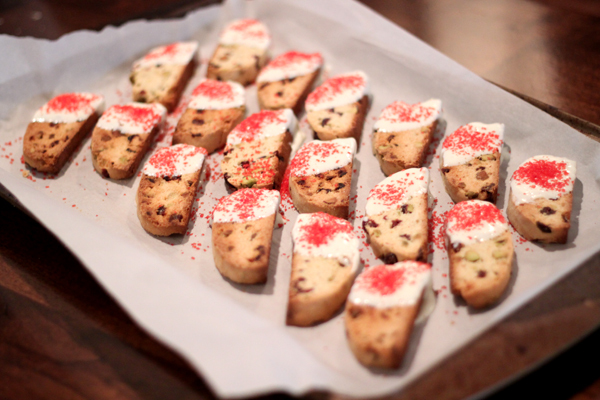 This recipe is from Giada and is a version of her traditional biscotti with a Christmas spin. 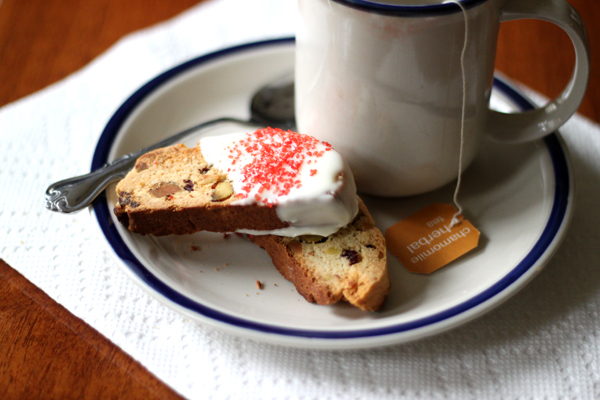 If you don’t have white chocolate on hand or prefer your biscotti plain, you can easily skip the dipping part of the recipe. See below! It’s been about two weeks in Venice, and so far the biggest surprise has been this: the food in Venice is mediocre at best. Much of this, I believe, can be attributed to the rampant tourism industry, and tourist menus abound on almost every street, unless you wander far away from the crowds. Even then, you’re going to be paying a lot for a so-so meal, unless you’re careful. This is not to be pessimistic though — there are some great places to eat if you take the time to seek them out! They’re just hidden from the daily crowds or cost a small fortune. But even though Venice is not known for its food in the way that Rome and Florence are, the desserts are still spectacular. I think I average about two gelatos a day, sometimes more (and I’m really not picky about ice cream, so it’s relatively easy for me to find a gelato place I’m happy with). 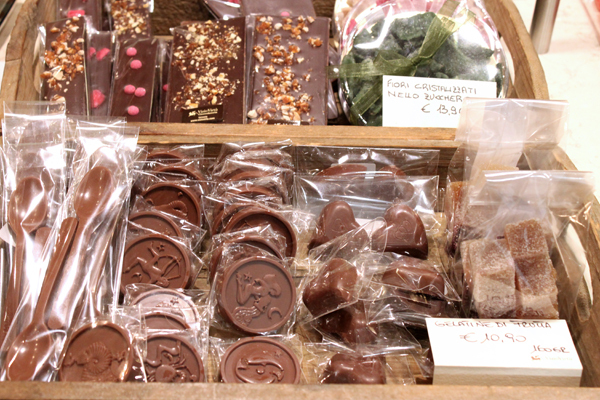 So, naturally, when I repeatedly read about “the best chocolate shop” in Venice, I had to go. Immediately. 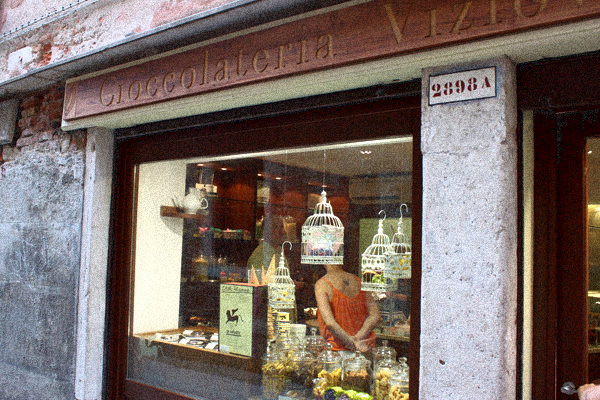 Vizio Virtù is easy to find and absolutely fantastic — if you’re ever in Venice (or Italy, for that matter), do not miss this place! Simply put, this place is divine. 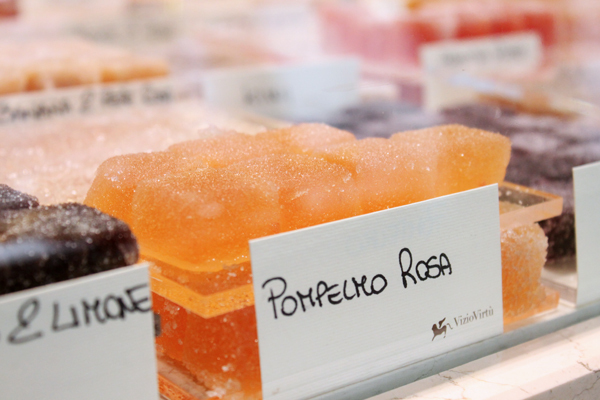 It’s nestled in the neighborhood of San Polo, right by the San Tomà vaporetto (waterbus) stop. 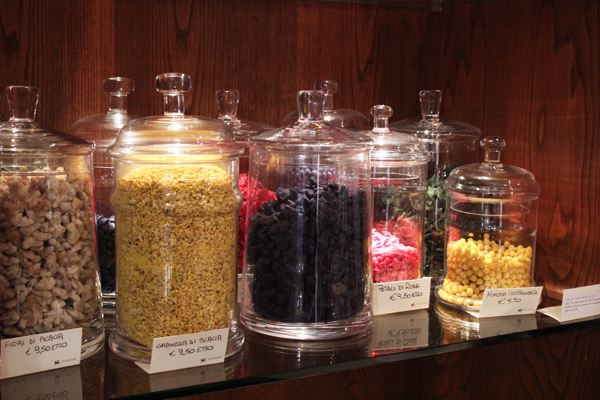 The façade is quaint and unassuming, and the shop is small but pristine. 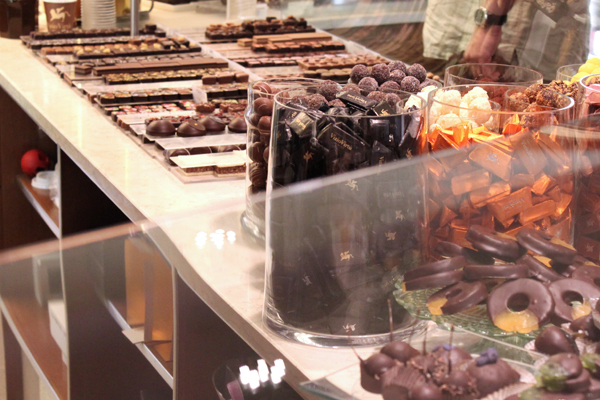 When I was in France a few years ago the chocolate was amazing, but I don’t think even that could compare to this. Of course, it’s ridiculously expensive. 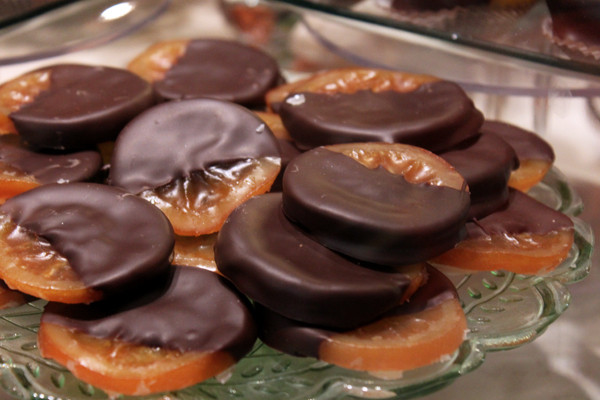 I tried the chocolate-dipped candied oranges (about 1 euro each) and the caramel chocolate bar (7 euros apiece). 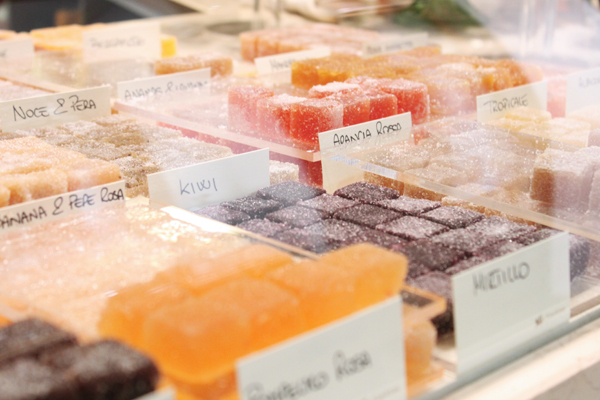 It’s definitely worth a stop though, even just to try a few of the by-the-kilo candies, and I can’t recommend this place enough — everything is exquisite. This place is a gem in Venice (a place where the food scene pales in comparison to the rest of Italy). 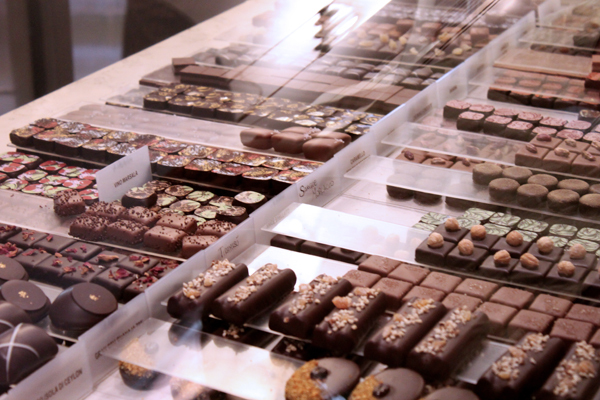 In addition to chocolates and jellies from the case, they also offer gelato, mousse, freshly baked brownies (which I have yet to try), and pre-wrapped chocolates, which are great for taking home — if you can make it that far. Directions: Take the vaporetto to the San Tomà stop. Walk until you reach a T-shaped intersection and turn left; the shop is on the right. Open from 10am-7:30pm, closed Sundays. Hello, readers! Sorry it’s been a while. I’m in the midst of finals at the moment (read: procrastinating on my philosophy paper), but I’ll be able to catch up on all the posting I’ve missed soon…and thank you ALL for your lovely comments (and emails)! I read all of them — they really do make my day, and I promise I will try to respond to everyone as soon as I can. 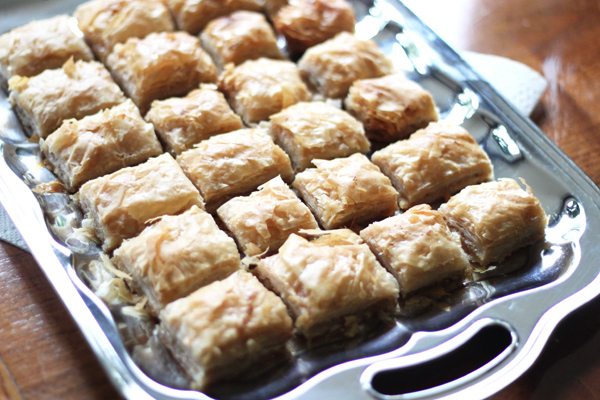 Here I’m posting my favorite baklava recipe. This stuff is so good that my aunt was sneaking it out in napkins during our family’s annual Christmas party. If you’ve never been a baklava fan, I hope you still give this a try — it’s made with walnuts and rosewater (as opposed to pistachios and honey) and is divine when served cold so that the sugars all have adequate time to soak in. I’m a bit of a connoisseur of baklava — I’ve tried baklava at every restaurant I’ve been to that serves it, and nothing has even come close to this. This is a Lebanese recipe, and you can find it buried in this ancient New York Time’s article (1989 what up), but I’ve also reproduced it below, with a few edits that really help simplify the process. Making baklava may seem intimidating, but I promise — it’s one of the easiest things you’ll ever do. You need to be patient and thorough, but otherwise no special skills are required! See my pointers below before you begin if you’re hesitant. 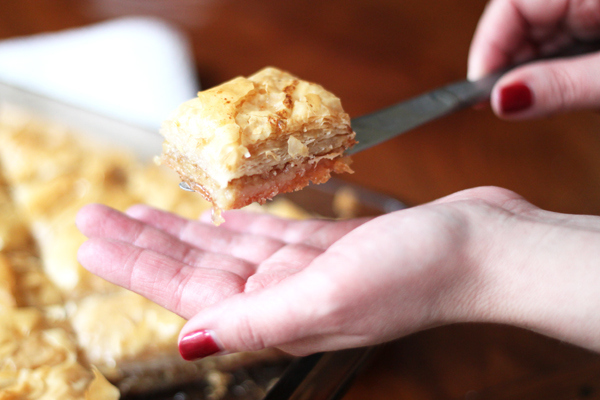 Make sure you butter thoroughly between every layer of phyllo. There is no such thing as too much butter! (Also, if you don’t use enough, the pieces will flake apart). Also be sure to give the corners special attention. 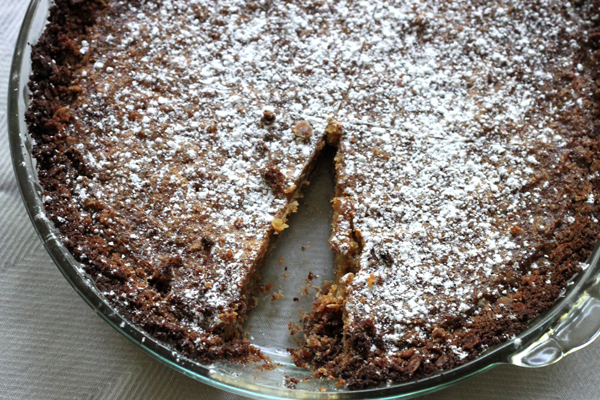 Use a glass/pyrex dish — it makes baking and clean up super easy. 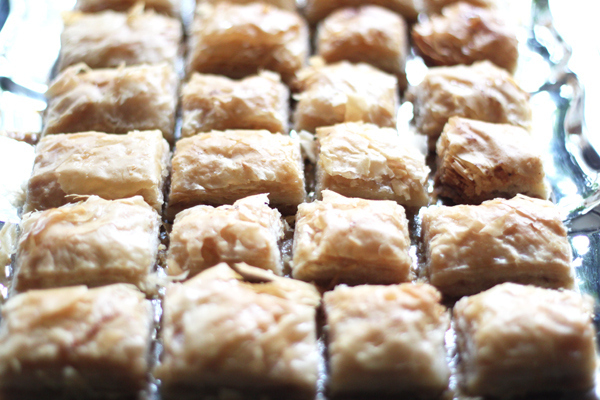 Baklava stores at room temperature for days — just be sure to cover with aluminum foil/cling-wrap/etc. If you can’t find rose water, you can also substitute orange blossom water (although I don’t really see how that would be any easier to find). You can usually find both in specialty grocery stores like Whole Foods, etc. If all else fails, you can order online (I promise, it’s totally worth it). 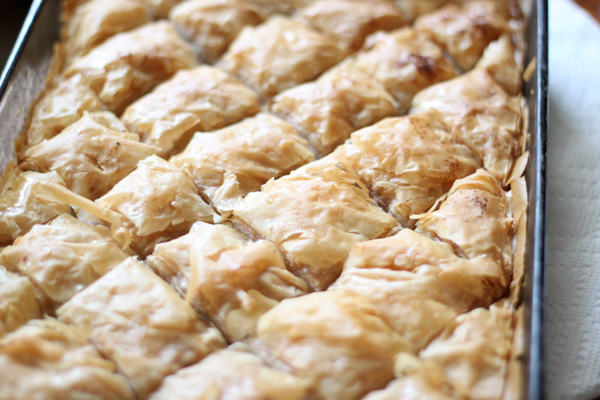 To thaw the phyllo dough, simply place it in the fridge the night before you plan on making the baklava. This will ensure that the sheets are not too brittle or too thawed, and will be easiest to handle! Sometimes they can still become a little flaky, though — not to worry! Just patch up the layers as best you can (with butter, of course) and the baklava will be just as delicious. Don’t be a perfectionist about clarifying the butter. It will taste the same in the end. To make sugar syrup, boil together sugar and water for about 2 minutes over high heat, being careful it does not burn or boil over. Just before removing from heat, stir in the rose water. Let cool slightly, then refrigerate until ready to use. To make the pastry, first clarify the butter. Melt in a pan over gentle heat. Spoon off the milky froth that rises to the top and the solid residue that settles to the bottom. One pound of butter should yield about 1 1/2 cups clarified butter. You can pour the butter into a mug for ease of use later on. Place walnuts and rose water in bowl of food processor and process in spurts until walnuts are minced. (The rose water helps keep walnuts from getting oily.) Add sugar and process briefly to mix well. Spread a sheet of plastic wrap or aluminum foil on a work surface. Open phyllo pastry and spread on the surface. Using the clarified butter and a pastry brush or clean paintbrush, butter a 10- by 14-inch baking pan liberally, bottom and sides. Place one sheet of phyllo pastry in bottom of pan. Butter surface of pastry. Proceed with the remaining sheets, buttering each one, until you have used about half the sheets in the box (aka one package). The phyllo sheets may be somewhat crowded in the pan, folded up a little along the sides and at each end. Be sure to butter the corners of the pastry. 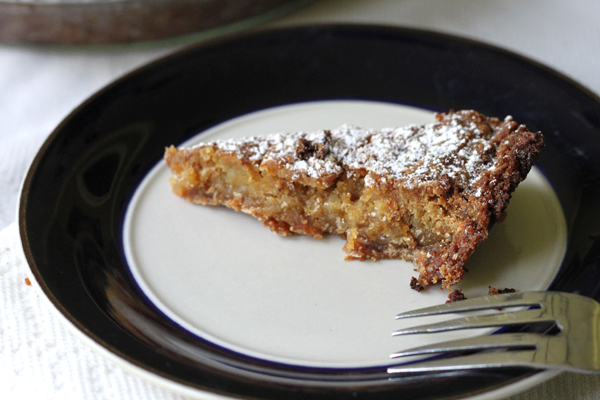 Distribute the walnut mixture over the pastry in an even layer. Place the remaining phyllo sheets over the walnut mixture, again buttering liberally between each layer. When all the sheets have been used, cut the pastry with a sharp knife lengthwise into strips about 1 inch wide, then on the diagonal to make diamonds. Be sure to cut right down through to the bottom of the pan. Pour any remaining clarified butter over the top of the pastry. Place in oven for 30 minutes, then raise temperature to 425 degrees and bake an additional 10 minutes, or until pastry is puffed and golden brown on top. Remove from oven and immediately pour cold syrup over hot pastry. 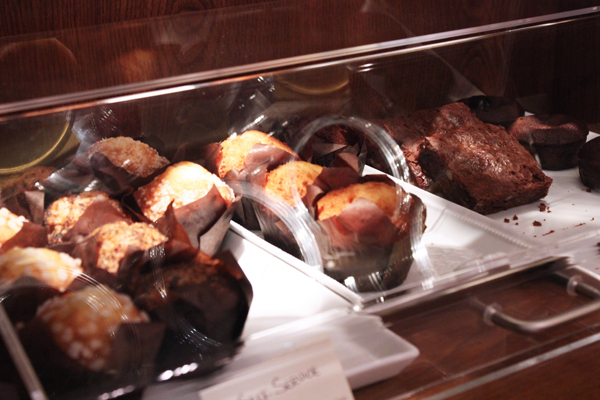 Set aside to cool to room temperature before serving. Also, I’ll be posting more in a week or so…look out for some more DIY and travel posts next!